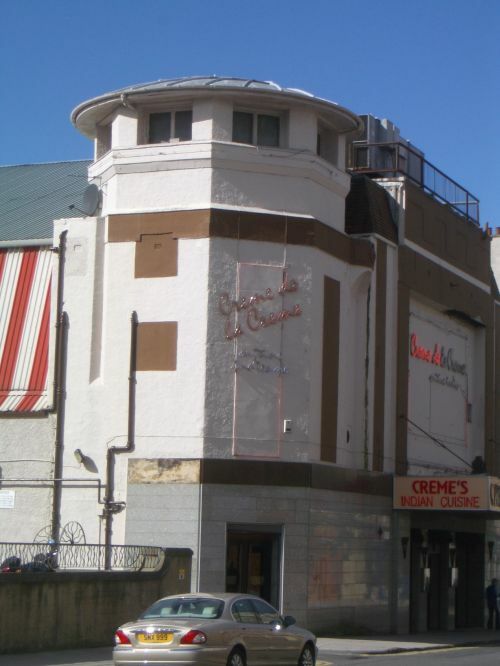 I’ve just heard that planning permission has been granted for the demolition of Crème de la Crème on Argyle St. It’s going to be replaced by an 8 storey block of flats (albeit designed by the recent RIAS award winners - Elder & Cannon). The planners describe the Crème de la Crème building (or former Kelvin Cinema) as of “little architectural merit” and the heritage section in the council recon it has is a “neutral / negative feature in the conservation area”. What a load of rot. The building is a landmark, and a damn sight more interesting than the category B listed tenements immediately to the west. Ok so it’s suffered quite a bit of unsympathetic alterations (the granite shopfront, the chopped down canopy, the plant on roof, & painting etc), but all of these are pretty superficial. I know that the facade retention of the Ascot cinema at Anniesland hasn’t been an out and out success, and I’ve yet to see what’s been done with the Toledo at Muirend, but I would have thought they could at least have tried to keep the frontage - After all it is the most interesting building on what is otherwise a pretty boring stretch of Argyle Street. You're quite right Bruce. How many blocks of luxury flats does Glasgow need? Who can afford to buy them? If it has to be housing, make it affordable or at least make use of an unusual or interesting building. There's big changes afoot for curry lovin' weegies! amcd wrote: You're quite right Bruce. How many blocks of luxury flats does Glasgow need? Who can afford to buy them? Another honkin' development involving an architectural eyesore. Why is Glasgow the home of so many horrible lookin' buildings right now???? Nice pic, Bruce, looks remarkably similar to the one on Gordon and I's website, even down to the same Jaguar parked outside! Coincidence I'm sure! Appologies for "borrowing" your piccy Gary. & I have to say your website is a great record of both what we have & what we've lost. Also intersting to see the old interior piccy. Who indeed? I happened to look in the estate agents window at Parkhead Cross the other day. The have one of the units that was built during the architecture festival that took place on the Green some years back. The one that looks like big steps, or a boat decks. Don't recall the full detail, but there was mention of three up-market appartment, inviting offers over £265,000. In a window at Parkhead Cross? They'll probably end up going for closer to a third of a million to give some developer 3 unit at 100 k a piece. 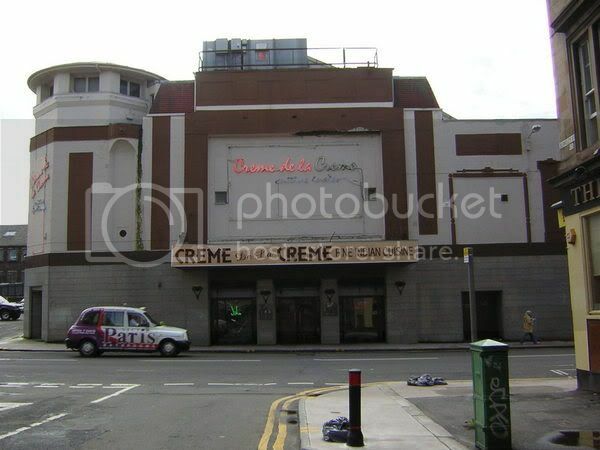 According to my sources the Creme de la Creme closed last Monday; and the interior is currently being emptied. Demolition is presumably not very far away... if anyone is passing and sees that they've started, please let me know ASAP! nodrog wrote: According to my sources the Creme de la Creme closed last Monday; and the interior is currently being emptied. I don't really think the Creme de la Creme building is of any real architechtural merit, but then I'm not ruling out that they will probably put up something at least as bad and probably much worse in it's place. As I stated in another thread (can't remember whitch one though? ), my boss has secured the security contract for the site during the building proccess, and is currently striving to obtain one for demolition to. I have been promised the site when things get underway, so hopefully I'll be on site during demolition with my camera in hand. In reference to the interior currently being ripped out, I definately saw a delivery taking place on Thursday morning, so can't be sure as to this being accurate or not, but'll definately go along tommorow and enquire about it. I'll keep you posted about dates and stuff, when I'm notified. The problem is, I've already been given 3 starting dates for it, only for the Creme to put back it's closing time on eatch occasion. Thats great gazza, keep us posted please! As another historical reference, post Kelvin Centre and pre-Creme de la creme it was for a while called "Louis" and was used as a gig venue. I saw the great Gil Scott Heron there many moons ago.